The Central Board of Secondary Education (CBSE) is to issue in the FIRST WEEK of July 2019, a detailed Notification to seek the Application Forms from the candidates aspiring to appear in the forthcoming Central Teacher Eligibility Test (CTET) – 2019 likely to be conducted on 07th July 2019. 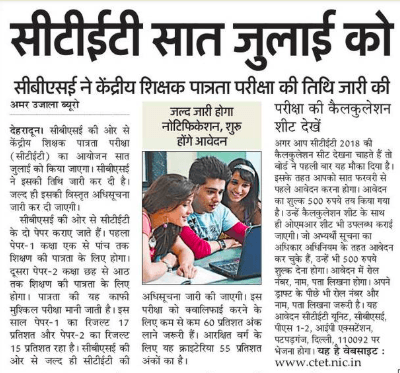 The Central Board of Secondary Education shall hold the Central Teacher Eligibility Test – 2019 for the Candidates desiring to appear for CTET on 07th July 2019. Applications are invited online from the eligible applicants very shortly through the official website. The Candidates intending to be Teacher for both Levels (First – Fifth & Sixth – Eighth Classes) shall have to appear in both Papers (i.e., Paper – I & Paper II). The Central Board of Secondary Education notified Central Teacher Eligibility Test – 2019 shall consist of the Objective-Type Multiple Choice Questions for the Primary Teacher and Elementary Level Teachers. Senior Secondary (or its equivalent) with, at least, 50% Marks and passed or appearing in the Final Year of 02-Year Diploma in Elementary Education (by whatever name known). Senior Secondary (or its equivalent) with at least 45% marks and passed or appearing in the Final Year of 02-Year Diploma in Elementary Education (by whatever name known), in accordance with the NCTE (Recognition Norms and Procedure), Regulations, 2002. Senior Secondary (or its equivalent) with, at least, 50% Marks and passed or appearing in the Final Year of 04-Year Bachelor of Elementary Education (B.El.Ed). Senior Secondary (or its equivalent) with, at least, 50% Marks and passed or appearing in the Final Year of 02-Year Diploma in Education (Special Education). Graduation and passed or appearing in the Final Year of two year Diploma in Elementary Education (D.EL. Ed.) (by whatever name known). Graduation and passed or appearing in the Final Year of 02-Year Diploma in Elementary Education (by whatever name known). Senior Secondary (or its equivalent) with, at least, 50% Marks and passed or appearing in the Final Year of 4-year Bachelor in Elementary Education (B.El.Ed). Senior Secondary (or its equivalent) with, at least, 50% Marks and passed or appearing in the Final Year of 04-year B.A/B.Sc.Ed or B.A. Ed/B.Sc.Ed. The Central Board of Secondary Education shall give relaxations up to 5% to the candidates belonging to OBC / SC / ST/ DAP Categories. Depositing in Central Board of Secondary Education Bank Account with Syndicate Bank / Canara Bank directly by downloading the Challan Form from the Central Board of Secondary Education CTET Website. For further assistance in respect of CTET – 2019, we advise our visitors to log in to www:ctet.nic.in.